Oh my. Cheesecake and fresh apple pie filling. I do believe this may be a new definition of heaven. And to think I was wondering what to do with the apples I just bought yesterday at the produce store. Just Putzing Around the Kitchen may have come up with the perfect solution. (1) Preheat oven to 300. Line muffin tin with cupcake liners. Set aside. (2) In a large bowl, mix cream cheese and sugar until smooth and creamy. (3) Add eggs, vanilla and cinnamon. Mix well. (4) Spoon cheesecake mixture into cupcake liners, each about 2/3 full. (5) Bake for 40 minutes. Pull out of the oven and set aside to cool. Leave oven on, and do not remove cupcakes from the tin. **Cupcakes will come out puffy, but the middle will sink in drastically — this is good! (6) In a small bowl, combine sour cream, sugar, and vanilla. Mix well. (7) When cupcakes have cooled, spoon about a tablespoon of the sour cream topping into the sunken middles of each cupcake. **Use more if necessary — I like to see a heaping mound peeking over the edges of the cupcake. (8) Stick cupcakes back in the oven for 5 more minutes. 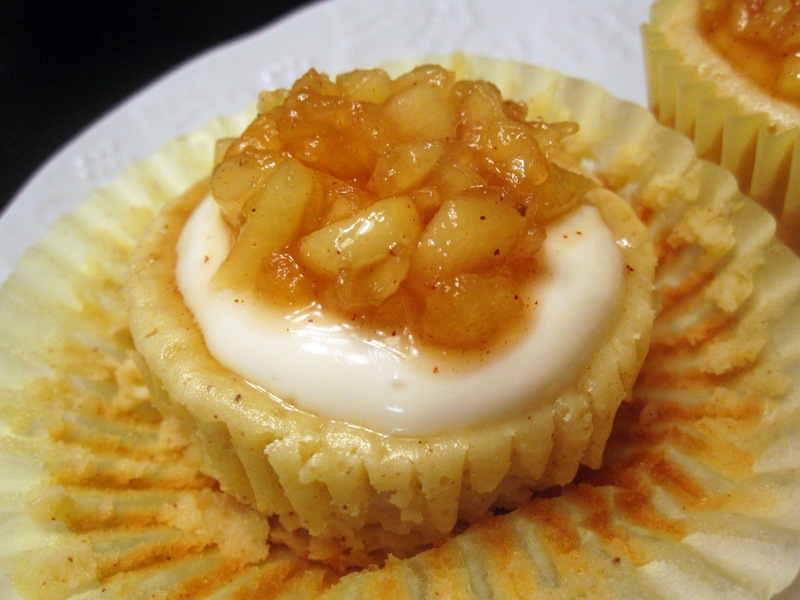 (9) While you’re waiting for the cupcakes to cool again, start the apple topping. Place apples in a small pot or saucepan, and cook on high heat. (10) Add sugars and stir. The apples should start getting juicy right away. (11) Add lemon juice and cinnamon. Keep stirring. (12) When the apple pieces start to look soft, throw in the corn starch. This will thicken up the juices and leave you with something similar to preserves. (13) Let the apple mixture cool before spooning on top of cupcakes. (14) Cupcakes are good warm, but even better after some time in the fridge/freezer. You are quite welcome! Thank you for visiting!